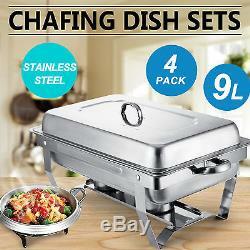 Stainless Steel Folding Chafer Rectangular Chafing Dish Sets. 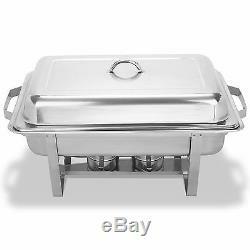 This brand new chafing dish can be used for a very long time and is easy to store and clean, quickly and conveniently show off your most popular dish with this 9 quart economic folding chafer kit. This rectangular chafer combines style with durability to ensure a lasting product that will impress your guests and customers. This chafer is resistant to corrosion and provides a sparkling, silver exterior. The lid's decorating handle provides safe and easy access to your food. It comes with a uniquely designed folding frame that includes an attached lid holder and collapses for easy storage and transport. 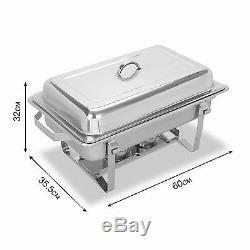 This chafer's elevated chafer stand is close to the water pan, maintaining your food's perfect serving temperature for hours, meantime, minimizing the flame exposure , so as to ensure guests and staff in safety. 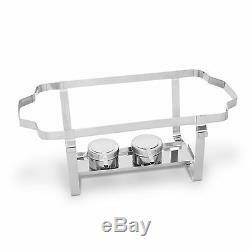 And the two handles on each side is designed under the consideration of serving dishes and safety. 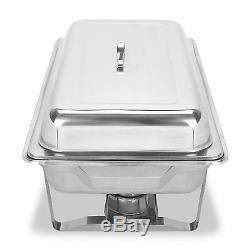 This brand new stainless steel 9 quart welded chafing dish is made of stainless steel l for long-lasting durability, making it ideal for buffets, hotel breakfast areas, brunches, catering, parties, wedding banquets and self-service environments. Please wash with boiling water before using. Keep clean and dry when storing. Mirror finish, polished finish on lid. Full stainless steel construction - robust, rust-free & easy to clean. Easy to use and won't overcook or burn food. Economic & convenient - keeps your food warm without using power. Handle on each side end for easy carrying & transport. 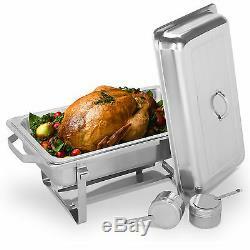 Versatile - 9l capacity holds a variety of foods such as meatballs, chicken, duck & more. Comes with two handy 2pc fuel holders. 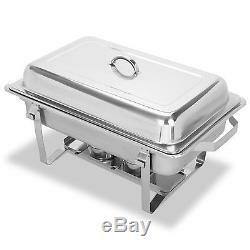 Comes with water pan, food pan, lid, folding frame and alcohol furnace. 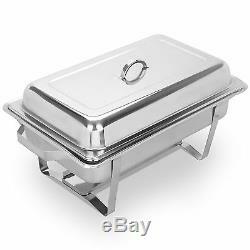 Cater pan, food pan & cover all electrolysis-finished for all food/hygiene requirements. Dimensions: 605x370x240mm/23.82x14.57x9.45inch. Deepwater plate size: 558x355x100mm/21.97x13.97x3.93inch. 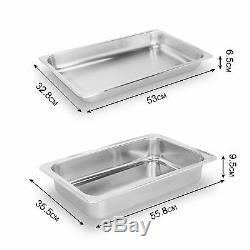 Food tray size: 530x328x60mm/20.87x12.91x2.36inch. Shelf size: 600x335x220mm/23.62x13.19x8.66inch. Fuel holder size: 170x95x65mm/6.69x3.74x2.56inch. Cover: 530x328x60mm/20.87x12.91x2.36inch. Package weight: 5.5 kg. 4 x Full size folding chafer frames. 4 x Deep water pans. 4 x Deep food pans. 4 x Fuel holder trays. As a leading and emerging company in manufactory and exporting business, we are specialized in Business and Industrial Products, Sporting Goods, Pet Products, Home and Garden products for more than 10 years. We believe that it is our vision and mission to provide innovative products with best service and competitive price to satisfy you. Our goal is to make sure that you can find exactly what you are looking for and make it easy for you to place your orders. If you have any changes, pls inform us. You want to cancel an order. If you need further assembly instructions for a product. Any other unspecified questions or concerns. Special circumstances will be listed clearly in the listing. Please do check everything carefully after you received the parcel, any the damage except DOA (Dead-On-Arrival) would not be covered if it's your fault. A: The item ships from Rancho Cucamonga, CA, United States. A: Please log on your account. Q: How do I return an item? Please contact our customer service before you return an item. 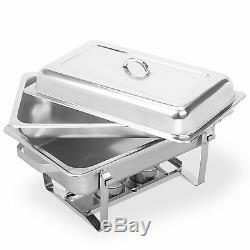 The item "4 PACK CHAFING DISH SETS BUFFET CATERING FOLDING CHAFER FULL SIZE 9 QUART" is in sale since Tuesday, October 11, 2016. This item is in the category "Business & Industrial\Restaurant & Food Service\Tabletop & Serving\Serving, Buffet & Catering\Chafers & Accessories". 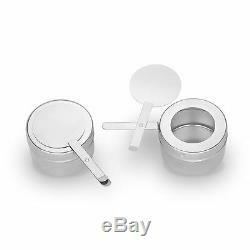 The seller is "world-etrade" and is located in Ontario, California. This item can be shipped worldwide.